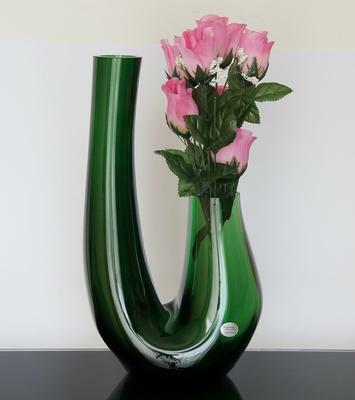 This double opening vase is made from a high quality, translucent green glass. Not only does this glass have a glistening crystal appearance, it also won't chip or break with normal use. On the bottom of this unit the vase rests on a solid base. This ensures that you won't accidentally knock this vase over. On one side the chamber stretches out tall and narrow, making it ideal for longer stem flowers. On the other side of this vase, the chamber is wider and shorter which makes it a good fit for a smaller bunch of flowers. The whole unit is going to add an elegant look to any kitchen, dining room or home office. 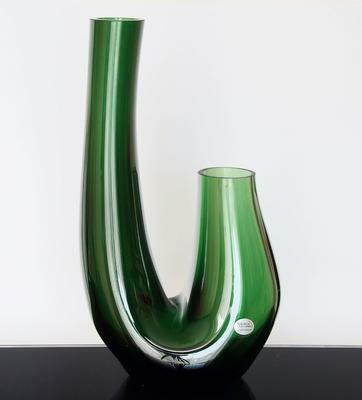 This vase will make the perfect present for anyone with an upcoming birthday or anniversary. Height: 34 cm. Weight: 1900 g.